An interview with Catholic author, Donna-Marie Cooper O’Boyle, on Blessed Teresa of Calcutta. Welcome , Donna-Marie! As you know, I’m a devoted fan of your books, so it’s an honor to have you join us to chat about your absolutely superb new booklet through Ave Maria Press, Bringing Lent Home With Mother Teresa: Prayers, Reflections, and Activities for Families, which has just been released! Congratulations! Tell us how this project came about. Thank you very much, Lisa. I am excited about the release of this book because of what I feel it can do to aid families during their Lenten journey. This book came about through collaborating with Ave Maria Press who approached me and asked me if I could write it for them. I was delighted at the opportunity of course, since I love to pass on Mother Teresa’s spirituality. I really can’t recommend this resource highly enough. At only 96 pages, it’s just beautifully put together and packed with quotes from Mother Teresa and fascinating true stories about her life, insightful reflections for parents, activities for children, and more. It’s quite a package and extremely affordable at $2.50. It would make a great gift for Lent for every family on anybody’s gift-giving list. I’d say it’s the perfect Valentine! Thanks, Lisa. I am very glad it’s so affordable for families. Parish ministers can purchase them from Ave Maria Press in bulk quantities for their parishes too. That number, folks is 800-282-1865, for bulk orders, or you can go to the website! Would you mind giving us a little personal insight into your life of faith? Many people know from your interviews and from your prolific writing and speaking career, that you had a close friendship with Mother Teresa (now Blessed Teresa of Calcutta). How would you say her influence on you has changed your outlook on life, family, and faith, and what are the fruits of that change? First of all, I am a Catholic wife and mother of five on earth and three in heaven. I’ve been a catechist for over twenty-five years because I feel I should always give back and I just love teaching kids the Faith. We have to get to them when they’re young. I also feel that we need to reach their mothers too—the hearts of the home so that they will have the tools to equip them in the training of their families so they can raise their little saints to heaven! 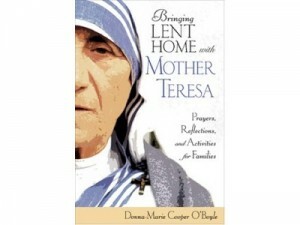 This book, Bringing Lent Home with Mother Teresa, I hope will do both: reach the parents and the children and give them something very inspiring to think about and do during Lent. I think it would be difficult for me to try to express exactly how Mother Teresa’s influence has changed my outlook on life. I did my best to express it in my book Mother Teresa and Me: Ten Years of Friendship, in which I talk about how my life naturally unfolded deeper in ministry after meeting and coming to know Blessed Teresa. I know that you had the privilege of a number of private visits with her and exchanged many letters over the years. What would surprise us most about the humanity of this iconic “Saint of the Gutters”? Blessed Teresa was very short in stature. I was a bit startled to see how short she really was when I first met her. And, what I find quite extraordinary is how this “little” woman changed the way the whole world viewed poverty and the poor because of her “Yes” to God. She taught us that there exists a greater hunger in our world than the hunger for a piece of bread. People are starving, especially in our western world, for love. They may look all put together, but they may be hurting inside due to loneliness. Mother Teresa encouraged us to reach out and love them, to see Jesus in them as she did and strive to satiate Jesus’ thirst on the Cross. Many people have said they were very emotionally moved when in her presence. Can you comment on this? Blessed Teresa truly allowed Jesus to live within her and asked that He love through her. So, it should be no surprise that one would be quite moved to be in her presence. My experience was that she radiated a deep peace and an intense love. And, as exciting as it was to be with her, I felt at total peace. I really felt like I had known her all my life. I recount this and other details in my book Mother Teresa and Me. Donna-Marie, when I read your work, I feel the prayerful love that goes into the writing and research. I also see on every page your humble obedience to the Magisterial authority of the Catholic Church. How freeing is it to humbly submit your work in the midst of a hectic public life? Thank you again for such kind words. I am so very delighted to submit my work to the world. It is all with God’s generous grace without which I could do nothing. I pray that my writings and talks will stir the soul and inspire others to come closer to God. I had the honor of writing a brief endorsement for Bringing Lent Home, so I got to read it ahead of publication. I was very taken with it from the first pages and read it over several times. I found new insights and delights to enjoy with each reading. It’s just so rich. I can’t wait to use it with my family this Lent. I’m so glad that you enjoyed it so much and thank you very much for your endorsement! I truly loved creating it and weaving words together to hopefully inspire families to a deeper Lenten observance that will hopefully please God. You have another new book, a full-length manual for Catholic mothers that I also just totally loved and could not put down. I’m laughing, because I swore I didn’t have time to read it and then time just expanded and I gobbled it up. Afterward I started wondering if maybe I had a mystical gift of some sort. Could you tell us a little bit about Embracing Motherhood and what inspired you to write it? Thanks, Lisa. I’m glad you liked this one too. I wrote Embracing Motherhood because I want mothers to really and truly embrace their role as a mother as a holy vocation in which they actually work out their salvation and help their family do so as well, right within the walls of their domestic churches. So many mothers these days have a tough time because the culture dictates to them what they “should” be doing and family life is attacked at every turn in a darkened world. It’s no easy task to raise faithful children today. As well, many mothers are so tremendously busy that they may lose sight of the fact that it was God who placed them in the heart of their home to raise their children on the straight and narrow. Sometimes the work in the home seems like nothing but dishes, demands, and diapers, temper tantrums, and teen-aged angst. But, there truly is a divine purpose to all of what we do and deal with as Christian mothers and hopefully my book will provide welcome advice to the weary moms out there. I also impress upon mothers to call on God for the graces to not only endure, but to shine throughout their tasks they do as mothers. Embracing Motherhood has got the best discussion questions I have ever seen for a resource like this. It would be perfect for group use, but I liked it for my own private reflections, too. I’m glad you like them. I like to offer some food for thought to give the reader something to ponder. I hope that women will gather together as they have been doing with some of my other books and discuss their faith and share their insights with one another in a group study setting either in person at their parish or homes or even through the internet. Lisa, you mentioned fearing you didn’t have enough time to read the book. I have good news for you. My book Embracing Motherhood is also available in audio format too (narrated by me)! It was a fun and very interesting experience doing the recording. I received a couple of the very first copies of the audio version today. Is there anything else you’d like to add about either book, any upcoming episodes of your show on EWTN, writing or speaking projects coming up? Yes. I recently taped a television segment with Fr. Benedict Groeschel for his show, “Sunday Night Prime.” Our segment is all about dear Mother Teresa and will air in February or March. Once I know the air date, I will post it to my website and blogs. Additionally, the first twenty-five segments of my EWTN show, “Everyday Blessings for Catholic Moms,” has now been produced into a DVD, which is available at EWTN and my website. The second twenty-five segments will air on EWTN in the near future and will be available as well on DVD. Today, a radio interview was released, that I did recently. It’s here in this link. You need to click the link and look on the right of the page for “American Catholic Radio.” Click that and you’ll see info about my radio segment (#12-03). Click the play button and enjoy. For a short YouTube book trailer of Embracing Motherhood, you can check it out here. They can find me at: www.donnacooperoboyle.com. They can get to my blogs through my website. I hope they’ll visit me there. I am on Facebook and Twitter and have a “fan” page on Face Book. Thank you so much! It was great talking with you. You have a very natural gift for encouraging and uplifting women. We need it! Keep up the amazing work. Thank you very much for the interview, Lisa. It has been a great pleasure. Thank you for your kind words and for taking the time to interview me and help get the word out about my new books. All with God’s amazing grace, I plan to continue to do my part to encourage and uplift the spirits of women and families everywhere! God bless you!